Have your Birthday party at MFC! We offer a FUN, ACTION-PACKED, and UNIQUE birthday party experience! Let us do all the work while you and your guests have all the fun. Please pick from one of our three party packages below. The Basic Party is $450.00 for up to 10 guests. Each additional guest is $40. Audio equipment for background music. Connect from your cell phone via Bluetooth or sign into your Pandora or Youtube account. Inform participants of dress code: Sneakers, T-shirts, and shorts/sweatpants. Contact us here for any other questions you may have. The Premium Party is $670.00 for up to 10 guests. Each additional guest is $40. The Private Party is $1,800.00 for up to 20 guests. Each additional guest is $40. Corporate Events and Team Building at MFC! 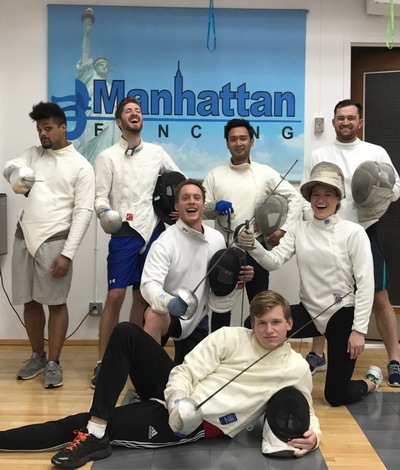 Fencing is known as physical chess. It teaches decision-making skills, the ability to perform under pressure, developing and following strategies, as well as fostering good communication between team members. Let us bring your team closer together with a fun and action packed event! Dress code: Indoor-Clean Sneakers, T-shirts, and sweatpants. Contact us here for group pricing and availability.